Home owners have their homes showcased in Morris Realty’s Welcome Home Magazine which is offered year round and displays their homes in color with photos taken by a photographer from Akers Media Group. 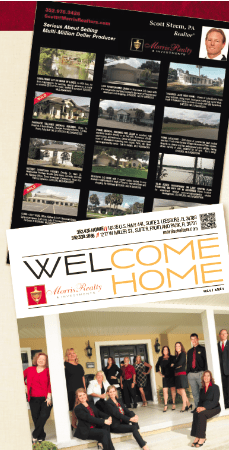 Welcome Home Magazine is produced year round and inserted into Lake & Sumter Style or Village Style Magazines 7 months of the year. Style Magazines cover all of Lake and Sumter Counties with a combined readership of over 210,000 readers each month. We also have a strong web presence with www.lakeandsumterstyle.com getting anywhere from 300,000 to 500,000 hits every month. This is important because Morris Realty’s Welcome Home Digital Magazine is placed prominently on our website’s main page along with our other publications.